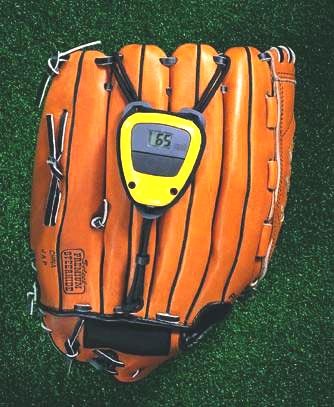 Glove Radar uses Doppler radar and easily attaches to baseball or softball glove to measure the speed of the ball just before it is caught. Powered by a single cell lithium battery, the transmission level is very low. Indicates calculated miles-per-hour ball speed on a liquid crystal display (LCD).